What was that sound you just heard? 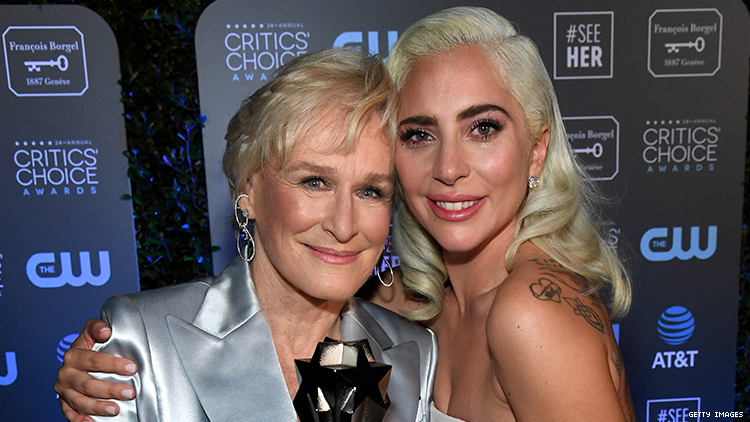 It was every gay cater waiter at the Critics Choice Awards gasping in unison as Lady Gaga and Glenn Close tied for Best Actress. Who even knew that you could tie at an awards show? Maybe it’s only possible when that awards show is aired on The CW? Gaga revealed that she was especially happy to tie with Close as the actress is “good friends” at her mother, meaning they probably share bottles of Pinot Grigio over meatballs at Germanotta family eatery Joanne Trattoria. Gaga and Close were both nominated in the Best Actress category at last week’s Golden Globe Awards, with Close winning for her role in The Wife. In an even more surprising twist, Gaga and Close weren’t the only ladies who tied at the awards ceremony. Amy Adams and Patricia Arquette both won a Critics Choice Award for best actress in a limited series for their roles in Sharp Objects and Escape at Dannemora, respectively. “I actually can’t think of a more beautiful thing than a tie, because there really isn’t a winner when we get to do such great work and we have such wonderful opportunities,” Adams said. And let’s celebrate that!